The FBD 2000 is a compact, portable dryer. It's powerful air delivery system makes drying a very fast operation. The fluidisation mixes and separates the particles minimising the risk of abrasion and the creation of lumps resulting in a truly representative sample. The comprehensive set of controls makes it ideal for use in the laboratory on a wide selection of materials. High air flow rates provide high rates of heat transfer and ensure much faster and more homogeneous drying than other methods such as an oven, microwave and vacuum drying. Drying times range from a few seconds to minutes. Complete drying is usually achieved in under 15 minutes. A powerful fan delivers the high volume of air flow from the base of the unit into a special tub assembly which holds the sample material. 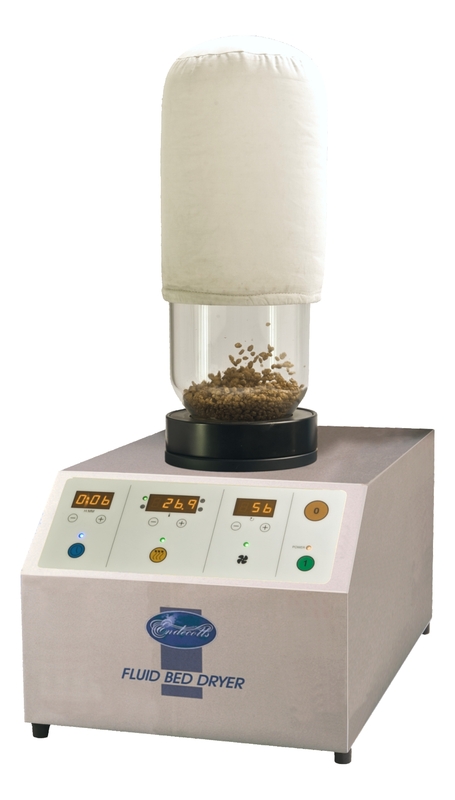 The flow of heated air passes through a diffuser gauze which supports the bed and evenly distributes the air as it passes into the tub.A filter bag at the top of the tub keeps the sample in while allowing the air, moisture and gases to escape. Temperature Control - Air is heated by a 2kW electric heater and can be set to any temperature up to 200°C. The temperature is controlled by a closed loop system that can achieve stability to within 1°C. Timed Cycle - A built in timer enables the drying time to be pre-set and the drying operation to be carried out unattended. At the end of the cycle time an alarm sounds and the unit switches off automatically. Air Flow - The air flow rate and fluidisation velocity are infinitely variable from 0.4 to 2.4 m/min volume (0.9 to 5 m/sec speed). Optimum levels can be set by observing the sample behaviour within the glass tubs. Filter Bag Material - Filter bags are usually nylon or terylene with other materials available to suit more aggressive conditions such as sustained high temperature drying. Efficient - higher rates of heat transfer ensure faster and more homogenous drying than oven, microwave or vacuum drying.